Quill is doing great! Marina and I are enjoying him very much. Quill wants nothing more than to hunt and be with us. My hunting buddy and I took a week off from work to go north for an elk hunt and decided to take Quill along for the ride. After spending a few days of scouting, driving, and hiking, we saw our first sign of life... A ruffie in a young pine forest. After trying to get Quill to scent and follow the bird my buddy noticed movement on the road ahead, another ruffie. Mike shot the bird, it fell in sight close to the road. We quickly pointed it out to quill. He watched the flapping bird with keen interest until it was still, after a couple seconds more it flapped another couple times, quill was on it! He proudly carried the bird in our direction, and with lots of praise and persuasion, gave it rto me. That was it, it was all about the grouse after that. We spent the rest of the time we had in some older forest we had found the grouse in last year. Quill was after them hard! 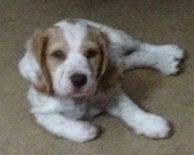 Quill's obedience is generally very good and he picks up training very fast, he really loves to please us! He loves Marina but seems to be a mans dog. 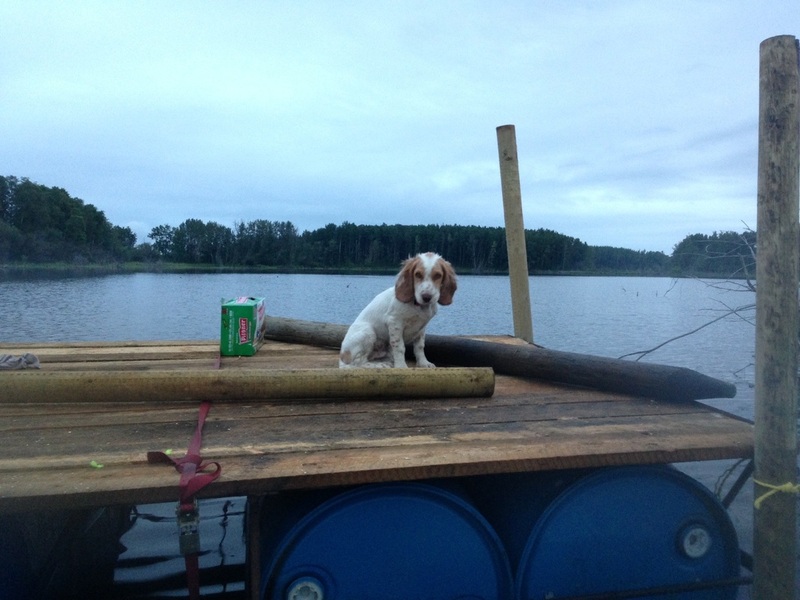 We are having a lot of fun with his ongoing training, and are going to join a near by NAVHDA chapter in the new year working towards field trials. I am very impressed with this pups drive. I have never seen such a bold puppy! He crashes through bush and brush like it isn't there. We love him very much, and are very great full to have him. We can't say enough good about our experience with you and your dogs. 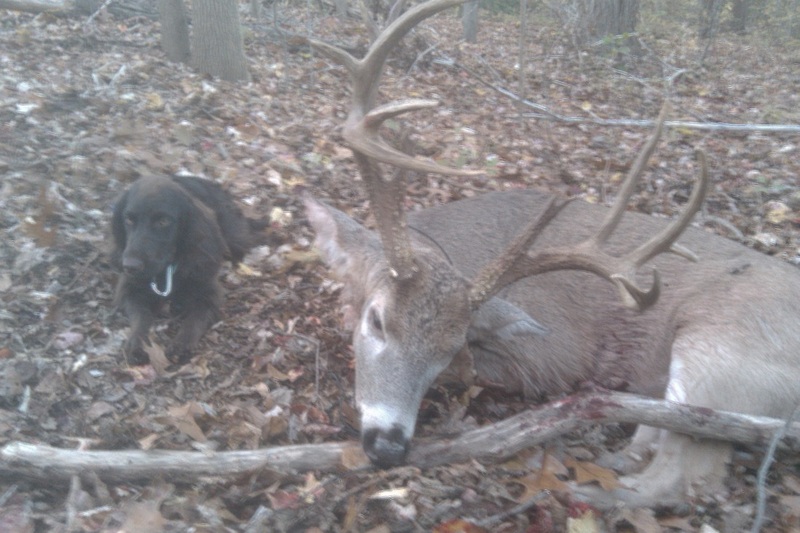 We will keep sending pictures and updates from our ongoing hunts! Things have been progressing with his trailing, flushing and retriever training as well. Tom joined a versatile hunting dog association, (Wild Rose NAVHDA) and they are very interested in the Wachtels! They all have pointers, so a flusher is rather exciting! We had to do some explaining when it came to Quills first few runs, but now they know what to expect. Quill has tremendous drive, and when on a trail will rip through bush like it isn't even there. He has decided that he is above retrieving pigeons, he prefers the more expensive chuckers. ; however he will still flush the pigeons if he has to. Haha!! 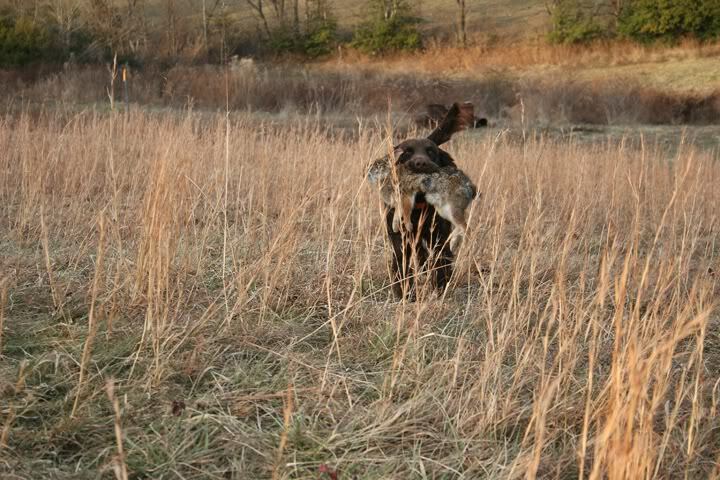 Quill has learned to quarter and Hup on command, making him easy to control in the field, and safe to hunt over. Tom built a training table in the back yard, and has been working on force fetching, to which Quill has been very receptive. Quill has been a real joy to train. He really wants to please us, and is always interested in what we are working on that day. We are very enthusiastic about the Wachtels, and are now seriously thinking about studding Quill, or getting a breeding female. We are wondering what our next steps should be in regards to getting Quill ready for breeding; if there are any DWNA hunting tests coming up or flushing (Spaniel) testing that we should be doing, as well as medical tests. We would love your input and any ideas on how to proceed. I've attached some recent photos, best of luck with your upcoming litter!! We love seeing your posts and updates on Facebook!! Rolf: Rolf (a Findus son) and I started our relationship when he was 6 months old. From the first Rolf impressed me with an extreme biddable personality. He is an uncommon combination of hunting drive and compliance. It is surprising how interested he is in learning and pleasing me. As a pup we ran a coyote trap line involving 35 traps. At each set, he would be told, "down" at an appropriate distance. After 3 days he no-longer required verbal commands, he would simply go down in all the spots I had instructed him on previous days. As is true of all hunting dogs, his hunting drive and ability had to be shaped. 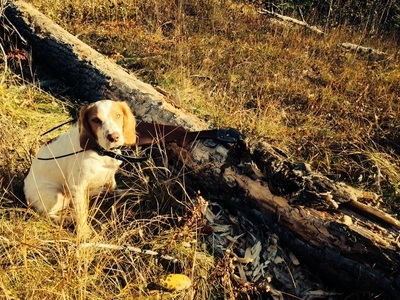 But, by the 3rd month of grouse season he was an effective grouse dog, retrieving to hand. 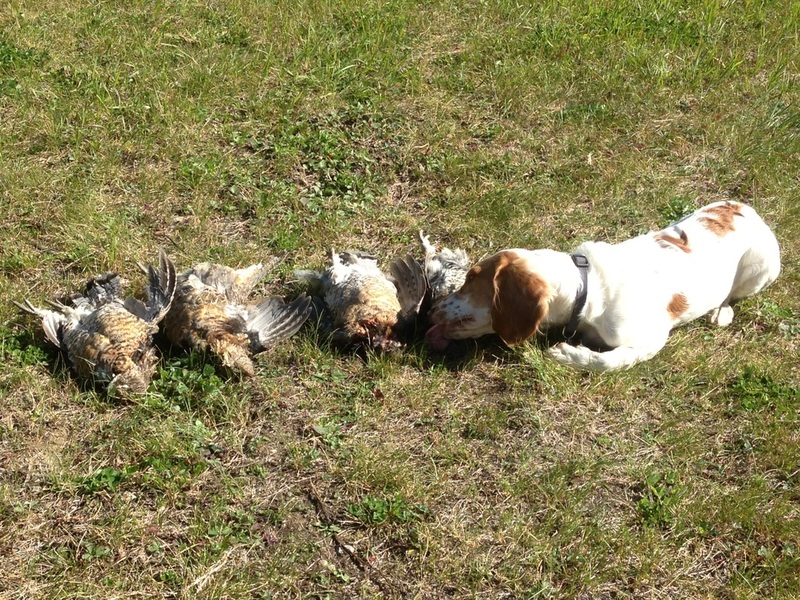 By the end of the season he was a grouse dog to be proud of, efficiently using a balanced combination of ground and air sent to locate game. What is more, he had learned the right kind of cover to hold game and was focusing his efforts in theses areas. 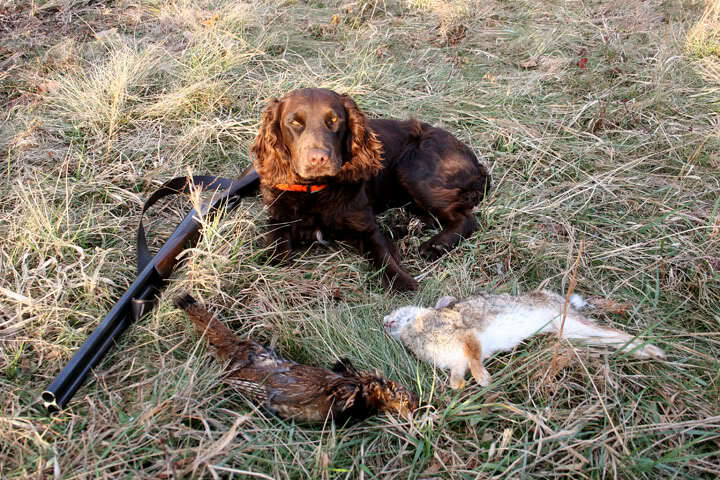 His abilities as a bird dog were confirmed in March 2011 at a RGF field trial were 13 month old Rolf won first place in the adult flushing category. The test involves 3 planted birds on 15 acres. The dog is given 15 minutes to find as many birds as he can. 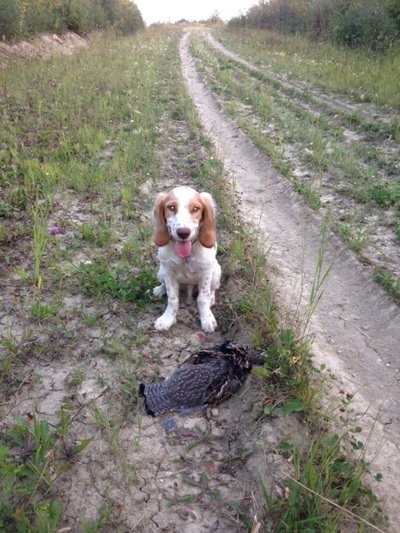 He is scored on number of flushes, retrieving ability, and time required to find birds. He found the 3 birds in 10 minutes and retrieved each to hand. From the beginning I have been impressed with the methodical accuracy of his tracking ability. Rolf's tracking follows the sent precisely as laid. I have never worked with a dog with a better nose. His tracking ability was confirmed in KS at the DWNA first JP test. 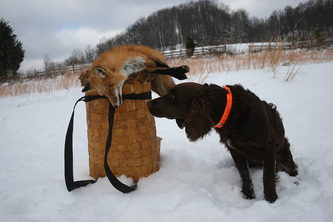 This test measures a young dogs natural ability to hunt. The most difficult part of the test is the hare track. 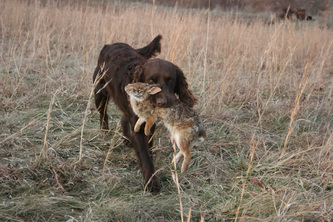 On a very dry windy day, Rolf tracked a jack rabbit accurately over 800 yards. His overall performance was excellent in all areas including obedience, confirmation, and hunting ability. His total score was 128 out of a possible 134. 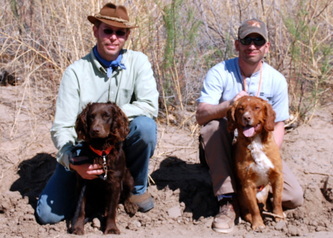 Rolf's 1st place score surpassed all other dogs present including experienced adult dogs. One other highlight from Rolf's first year is his solo performance at 9 months of age on a 150 lb wild boar. 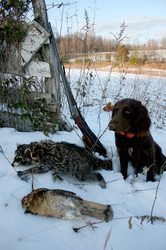 He bayed the wounded hog in a downed tree top allowing me to dispatch it with bird shot at point blank range. I never would have got the boar without him. 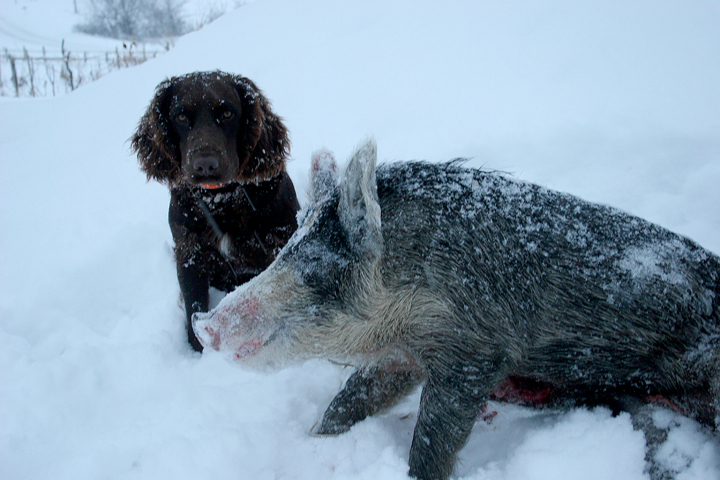 This was his first pig encounter and was an amazing instinctive performance. Rolf is a calm well mannered healthy Wachtel that has never shown aggression toward humans. 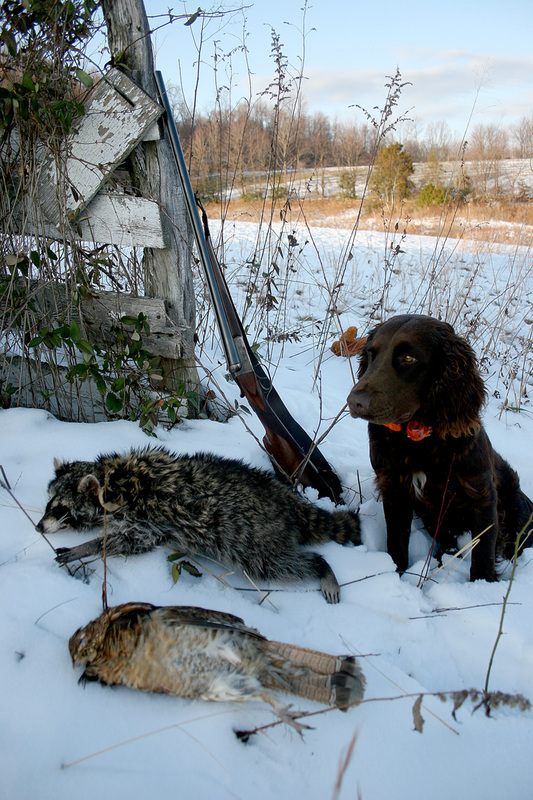 This is not my first hunting dog and I have a fare ability to judge a good gun dog. He is shaping up to be the best I have ever owned. He is simply a pleasure to be around. I highly recommend this line of Wachtels to serious hunters with high expectations. Hope all is well. I am off to a great start with "River". 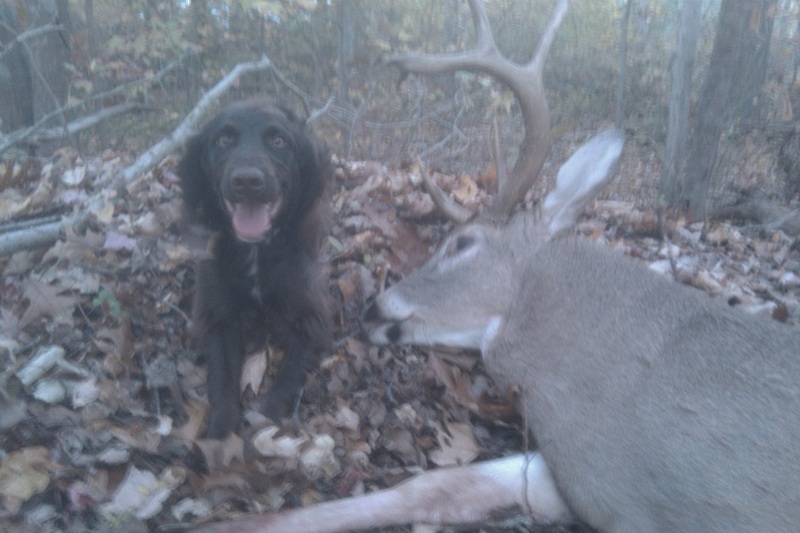 Yesterday he helped me find this nice white tail. We have been practicing a lot of blood trailing and he is getting pretty good at it. I am in an amazement as to how lucky I got, getting a dog like this. One Dog trainer said that I have hit the "jackpot". He got house trained in two weeks. Not once has he shown any aggression towards anyone. Still he is a very tough gentleman that will not back down for anything. He understands a multitude of commands and is a pleasure to have running loose in the woods. People always wants to know what kind of dog I got and I always get to hear what a beautiful dog he is.